Rakeysh Omprakash Mehra gave us two of the most ‘agreeable’ films of 21st century – Aks and Rang De Basanti. He also made Delhi 6 and Bhaag Milkha Bhaag­ which were middling to some, stirring to others. All of them generated conversations galore – on their respective stories, making, music and the works. With his latest offering Mirzya, one doubts if he is eyeing the dangerous Sanjay Leela Bhansali territory. Well, not quite. Mirzya, as its odd trailer suggests, is a modern day take on the Punjabi legend of Mirza Sahiban. As we know, folk tales are much like free content library. Our writers and filmmakers are not too ashamed of drawing ideas out of them. Hence, novelty should be the last thing to look for in Mirzya. There are ways to do justice to a folk tale if it were to be adapted – one is to be staunchly faithful and recreate it page by page. Another is to go the Bhansali route, create a lavish costume drama, complete it with confrontations, one-liners and elaborate dance numbers. Mehra picks a middle path, hits creative bankruptcy midway and sort of sleepwalks through the rest. To begin with, Mirzya is one film that paints a picture of how severely under-confident is Mehra with his base story. He seems to be wanting the best of all worlds. His attempt to juxtapose the present day romance to the supposed actual events, fall flat. The film starts off with a segment that is so visually overpowering that you judge the film right away. You hear a voice-over, camerawork that threatens you for attention, loud background score and bad VFX that will give 90s Cartoon Network a sigh of relief. We wonder who the target audience is! Mirzya soon cuts to our times and the narrative picks up. We see two lovers en route to school, Shakespeare’s verses, socio-economic divide et al. A twist separates the lovers, only till time reunites them. Our modern-day Mirza Sahiban’s adulthood is spent in Rajasthan amidst a ‘convenient’ royal family backdrop. Surprisingly, the supporting characters are better fleshed out than the leads. We totally understand the prince’s (Anuj Chaudhry) angst as he attempts to murder Mirza. We quiver alongside Zeenat (Anjali Patil) as she rubs a tattoo off her beloved’s back with a hot iron rod. One-sided love, beautifully written, presented and acted. Look at our leads. She is the prince’s city-educated fiancée. Our Mirza is her horse-riding tutor sans any sophistication. She is quickly drawn towards him because (ahem) opposites attract or perhaps their cosmic connection did the trick. In the MOST RANDOM moment one could ever cook up in a story of love, she confesses to him about her childhood romance. Saiyami Kher’s Suchitra could be one helluva down-to-earth girl, but her train of thoughts and resultant conversations demand no build-up or context whatsoever. Audience is taken aback, our Mirza isn’t. She reveals tiny details about her story and he stands still – pretending to be the universal receiver of pointless information. His subsequent outburst and the ‘love story’ that follows lack in a vital element that we call depth. Gulzar’s writing attempts to be excessively poetic. There are fine metaphors and cleverly penned lines all over. His eloquent songs convey a lot that dialogues (or lack of it) fail to. Unfortunately, these aren’t sufficient since our lead characters barely converse after the initial hullabaloo. We miss a Mani Ratnam-esque eye contact session that could at least have established a connect. Our protagonists and their actions have us stare with a facepalm expression and murmur, ‘what the hell is going on!’. There is no transition from a fleeting reunion to passionate love. 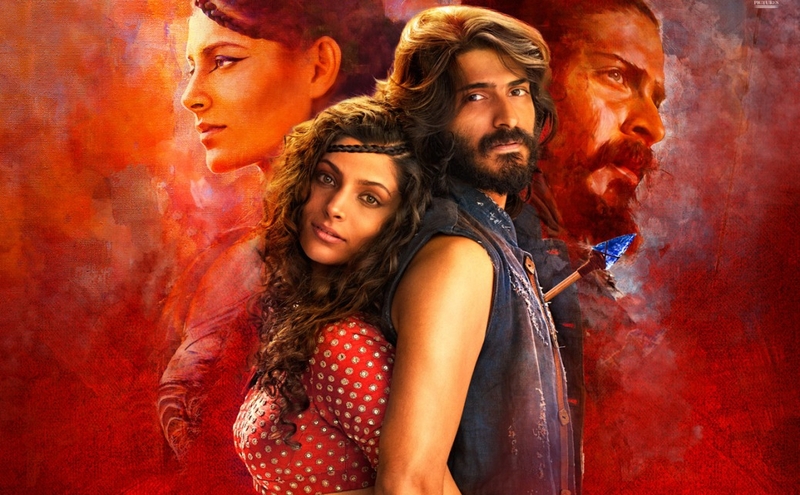 It helps Mirzya no better when a clueless Mehra unevenly sprinkles his narrative with jarring bits from the past, set in some sort of a la la land. One fails to believe this is an editing table disaster. We have P.S. Bharathi handling the department, out of all people. Lending Mehra a decent helping hand is Shankar-Ehsaan-Loy’s original score. The worded songs work beautifully; the background score doesn’t. The latter is so loud at places that it scarcely lets you concentrate or even look at the actors and their expressions. The director’s brief to cinematographer (Pawel Dyllus) must be blow his frames to such proportions that they will be auctioned as vintage paintings, if the film tanks. And boy, our cinematographer delivers them in gold standards. However, Mirzya isn’t a completely unwatchable film. The last reel in particular isn’t bad at all. There are certain intermittent portions with commendable directorial touch. It is just that the film gets lost somewhere in midst of visual imagery and poetic metaphors. Mehra meanders and occasionally throws a careless shocker, much like the stray desert cat. We feel worse because the lead pair look all sincere. Harshvardhan Kapoor looks like a real person, which is a welcome change from the Varun Dhawan prototypes we are subjected to. He pitches in a reasonable performance (for a newcomer) although his diction is worth all scrutiny considering the milieu of Mirzya. Tad bit less awkward is Saiyami Kher who has an appeal that is wildly sensual – much like her aunt Tanvi Azmi. Be those curly locks, defined jawline or emotive eyes, it is her personality that tries to convince us more than her performance in a sketchily written part. As mentioned earlier, it is Anuj Choudhry’s Karan and Anjali Patil’s Zeenat who take all our hearts. When Suchitra is introduced as an adult, we are also familiarized with her romantic liaison with Karan, the prince – which is so neatly done that you don’t see an iota of reason for her to stray. We readily buy Zeenat’s affection for Mirza too. Anyhow, her penultimate scene makes no sense, because we aren’t convinced of the passionless main leads ourselves. Rakeysh Omprakash Mehra’s isn’t a steep fall like Ashutosh Gowarikar’s with Mohenjo Daro. Just that we wish he had paid heed to what they say, ‘time is money’. Mehra and his writer insecurely invest in a lot of screen time to the parallel segment and ends up making no impact. We see a lot of money thrown on things that hardly take the story forward. If at all they wanted the legend be retold, why not base it in a relatable setup? Why employ a million clichés but zero layers? What are our modern Mirza Sahiban pining for? How about some love, some passion? If only the film had the confidence to match its telling soundtrack. If only the film cared for its viewers , their time and hard-earned money. Previous PostKhoya Khoya Chand – A grand 50s melodrama, retold in great style! Next Post“Pulimurugan” – A new standard for mass entertainers!